The fans have spoken. 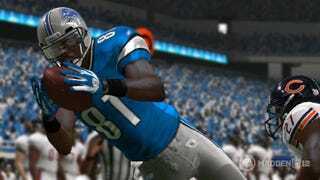 Madden 13's cover athlete will be Detroit Lions wide receiver Calvin "Megatron" Johnson. Publisher Electronic Arts revealed the news today at an event in New York City, where fans came out to watch finalists Johnson and Carolina Panthers quarterback Cam Newton as they had silly food-throwing competitions and jokingly gave one another crap over their respective pictures and stats. At the end of the event, EA proclaimed Johnson the winner. Sorry, Lions fans. You will now spend the entire year stressing out every time Johnson gets so much as grazed.